After sampling the big Wembley occasion last year Castleford Tigers are eager for a follow-up in 2015, but will have to upset the odds in their Ladbrokes Challenge Cup tie against Hull FC on Saturday according to head coach Daryl Powell. With Scott Wheeldon adding to the squad’s injury list this week Cas boss Powell reckons Hull will start favourites for the sixth round tie at the KC Stadium. 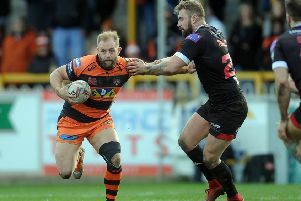 As many as 11 Tigers first teamers sat out training on Tuesday, although they are hopeful of having four men back who missed last Friday’s game at Wigan with Andy Lynch, Scott Moore, Oliver Holmes and Nathan Massey all expected to play and admit they are motivated to go on another cup run. Powell told the Express: “It’s one that we are desperately wanting to win, but Hull will be the same. They are at home so it will certainly be a tough game for us. “At this point with our injury list you’d make them favourites, but we are pretty confident ourselves. “We need to go over there with a plan, hopefully apply it and come away with a win. “We did pretty well in the Challenge Cup last year and we want to do that again. It’s an important competition and I’ve always tried to approach the cup in a positive way. The history of it speaks for itself. Cas will travel without forward Wheeldon, who has been ruled out for up to three months with a knee injury and Powell does not expect any of his longer term injury victims to be available, but the team should be stronger than the one that lost 28-0 to Wigan. He said: “Scott Wheeldon got a bad injury last week. He will be out for 10-12 weeks with a medial knee ligament injury. “Frankie Mariano also hurt his wrist, but hopefully he’ll be okay. “It’s a difficult period for us. We had 11 players missing from training on Tuesday so it’s a tough time. But we’ll ride through it and come out a bit stronger. “Scott Moore didn’t play at Wigan because of a broken toe. Nathan Massey had a wrist injury and with Olly Holmes it was his knee. Andy Lynch was rested. But they all should be okay for the cup game. “I don’t think we’ll have anyone else back. There’s a couple that are close. Denny Solomona got a good message from the specialist he saw on Monday so hopefully he will be okay for the week after.